Our trip to Gwangju, South Korea in order to participate in the Gwangju Asia Forum in May of 2018. My name is Brant Peterson and I have the honor of being the middle son of Arnold and Barbara Peterson. This is my first blog, so bear with me and be kind. 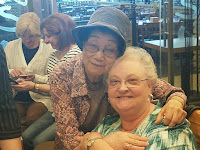 My mom and Aunt Martha Huntley have been invited to participate in the Gwangju Asia Forum in May of 2018 to share my parent's experiences during the Gwangju People's Uprising in May of 1980. When we lived in Gwangju, the anglican spelling was Kwangju. So in homage, I titled the blog with Kwangju but will use Gwangju in the rest of the blog as it is the current correct spelling. I will be accompanying my mother on her trip. As a Missionary Kid (MK) and a Third Culture Kid (TCK), I had accepted long ago that I would never be able to return to my home, so I am grateful for this opportunity. This blog will be a mixture of our present day adventures on our trip and recollections from the past. First, a little background for those of you that don't know me or haven't heard my crazy Korea stories. My parents served as Southern Baptist Missionaries in South Korea from 1974 to 1990. We would stay in Korea for 4 years, then return to the U.S.A. on furlough for 1 year. Thus, Korea became home and much more comfortable than the U.S. When we arrived it was dad, mom, my older brother Doug (8) and myself (2), but after about a year my little brother Chris was born in Korea. After a few years of language school we moved south to the provincial capital of Gwangju. Here is my quick history of what happened in Gwangju. In 1979 and 1980, when I was about 7 years old, the President of South Korea was assassinated, martial law was declared and General Chun Doo Hwan took control of the martial law authority. The people of Gwangju, especially college age students, marched in peaceful demonstrations asking for free and democratic elections. Long story short, the aforementioned general sent in military troops and they started beating and killing innocent people. My mom and dad worked with the Korean people that we knew and also documented the atrocities that they witnessed through notes and photographic evidence. Dad wrote a book on the topic that he self published and also that was published in South Korea in 1995. This led to his traveling to Korea and testifying before South Korean Congress regarding his experiences. Gwangju has been a part of our family lore over the years. Unfortunately my dad passed away in September of 2015 and so cannot travel this long road home with us. You can view his memorial Facebook page and also read his obituary. Mom has been invited to Gwangju because of these experiences. 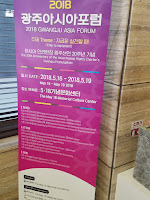 We are honored to participate in the Gwangju Asia Forum. Returning to Gwangju may dredge up more memories of that time, and will definitely draw me closer to my memories of my dad. Thanks for sharing your story Brant. I'm really looking forward to hearing about your trip in progress. It's an amazing opportunity to return to the place you spent so much time as a child, particularly under these circumstances. I am excited for you and your journey back to your other home! L am looking forward to your posts and pictures! This is so neat. I can't wait for your future blogs! Good job so far, keep telling us the history! Thank you for sharing this blog with us! I’m so happy for you and your mom having this wonderful opportunity to return home for a visit. Safe travels! God Bless! Blessings as you go. We lived in Kwangju for 4 years. We left a piece of our heart there. Your parents took us to Kwangju when we were in language school in Seoul. We moved into your house and loved our time there! Enjoy every minute! Thanks for this blog! Carolyn, I was on the compound yesterday and was able to stroll around. Sadly, our mutual house has been torn down and replaced by a dormitory for the local seminary. However, I think my father would have been happy with the idea that students are now residing and learning on that land. Even though the house is gone, the huge pecan tree from the front yard is still there. It brought me to tears to see it, a remainder of my past. I want to start by thanking the people of Gwangju who met with us today and apologize ahead of time for names that I have left out. They all were so very kind and spoke many complimentary words about my father, Arnold Peterson, and Uncle Betts Huntley. There were three families of which I am aware, that stayed in Gwangju during the People's Democratic Uprising in May of 1980. 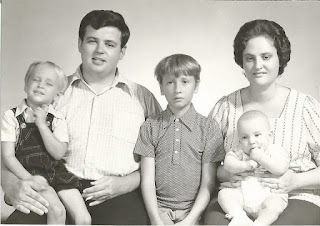 They were represented by the husbands, Arnold Peterson, Betts Huntley, and John Underwood. I started this blog entry with the quote from Edmund Burke because I think all three men would say that what they did was not heroic, as some have said, but just the right thing to do. If you see evil and do nothing, evil prevails. These three men, the people of Gwangju, and many others refused to do nothing. The Huntley family and the Peterson family started the day with registration at the Gwangju Asian Forum followed by the opening ceremonies and speeches. Aunt Martha Huntley and mom, Barbara Peterson, each delivered a speech regarding their remembrances of the 5-18 Gwangju People's Democratic Uprising.